I teach my children yoga through modeling. I let them see me practice, hear I am going to yoga, see where I practice and practice with me. We have yoga games. I have kid yoga books. There are Iyengar books for teaching children. Basically you teach the body and later the mind. As a child you don't worry about form. Think about playing as a child. Handstands, back bends, arm balances, rolling your feet backwards over your head. All of that is yoga. The poses are not strange new creations, but for many instinctual part of growing up. 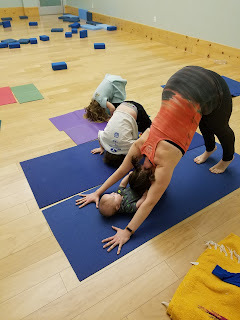 We teach the fun of yoga. Keep it quick paced, light-hearted. Only make corrections when there is a immediate dire need- bent arm or leg, leave it. I make it a habit to never correct, as it ruins the magic of the pose for children. A child wants to be in the pose more than adults do. So let them get in the pose and experience it.